Can you believe it’s already April?! I’m in total disbelief that it’s now officially Springtime here in Maine! I am most certainly looking forward to warmer temperatures as well as watching the snow melt, it’s rather exciting time around here! With Spring now here, it finally feels like the perfect time to revamp everything, from my hair color, makeup, right down to my wardrobe! 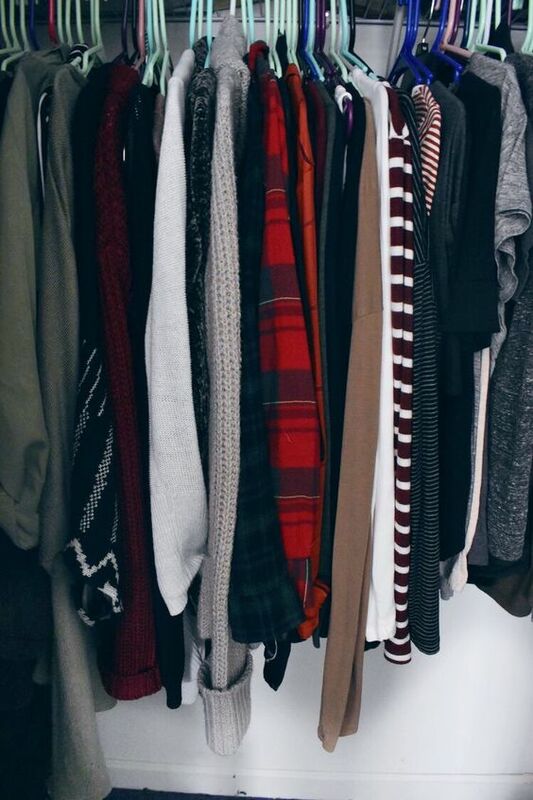 Lately, I’ve made it my mission to start the spring cleaning process by decluttering and organize my closet…. which sounds pretty daunting right? Wrong! Organizing a closet, of all things is probably the most fun. 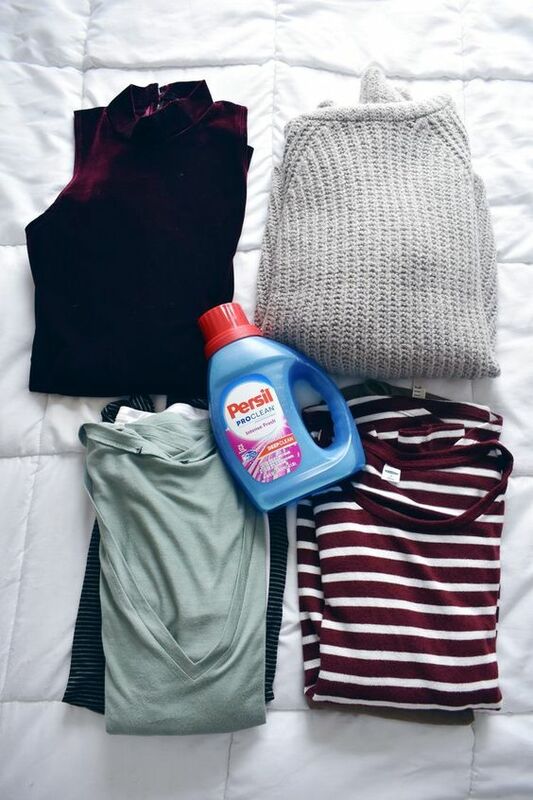 Today, I have teamed up with Walmart and Persil® ProClean® Laundry Detergent to share my best practices on how you can Spring Clean Your Wardrobe & how to keep your clothing in perfect condition with Persil. Simply walk into your closet, and take everything… I mean everything off the wracks and chuck it onto your bed. Don’t forget to include your shoes, scarves, anything else that falls under the “wardrobe” category. If you share a closet with your spouse like I do, challenge him to do the same process with you. By starting the “purge” you may find items you never knew you had, or rediscover an old favorite in the process. 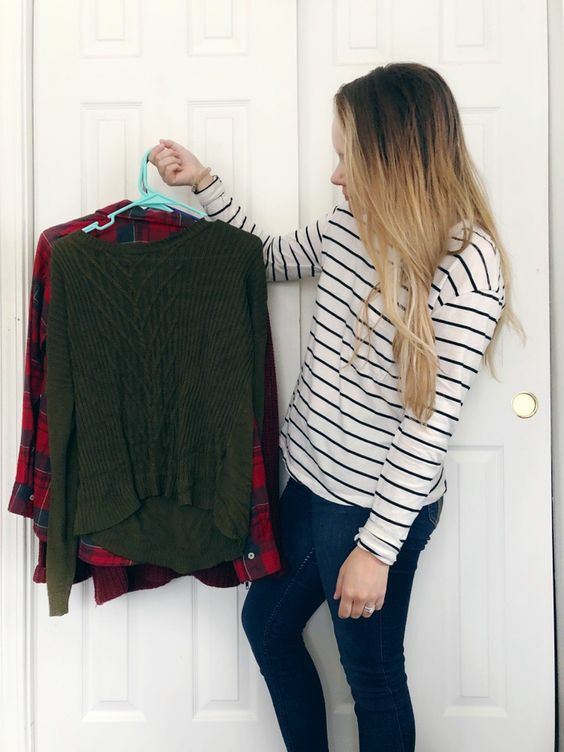 It can be daunting to simply empty your closet to begin with, but that’s what makes this process so effective. Now that you’ve emptied it, you can move on to step 2! Really take a moment to take it all in, and to look at how much you own. It can be shocking to discover you own 15+ tank tops when you only wear 5. If you own duplicates, donate them. If you come across seasonal pieces that you wont use in the next few months, simply store them under your bed in a storage container. By doing so, you’re freeing up more closet space (which your spouse may thank you for, haha!) If you see anything you already know needs to go, place it in a bag to donate. By now, you should already be a off to a good start. Once you answer these questions, do not overthink it. Whatever your first initial reaction is: just do it. When you overthink, it can lead to accumulation. Take it a step further by brainstorming how you can pair items together to form an outfit – that’s when the fun really starts. Allowing yourself to have fun in the process makes it go by quicker, and can help you reinvent your style. When you’ve finished trying everything on, you may find you’ve already tossed more items into the donation bag then you planned. Whatever is leftover after your initial purge, be sure to make sure you take good quality care of those pieces. You don’t want to hang onto anything that is stained, or faded. 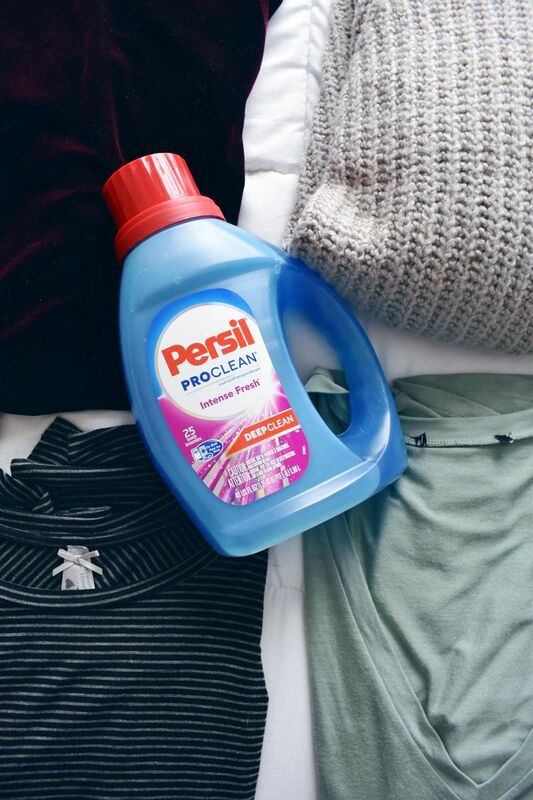 To make sure sure all of your clothes stay intact, bright, and fresh, always use Persil® ProClean® and experience a new level of deep clean. Thankfully, Persil® ProClean® is formulated to deliver a deep clean for whatever life (and stains) may throw at you, and has EXCEPTIONAL stain fighting ingredients, that feature enzymes specially designed to break down stains and deliver an exceptional deep clean. We love washing all of our clothes with Persil® because it gives our wardrobe a long lasting fresh scent, that extends long after washing. You want to ensure the pieces you’ve kept in your closet stay fresh, and bright, so be sure to protect and preserve their condition by using Persil® ProClean®. You can find Persil laundry detergent at your local Walmart! 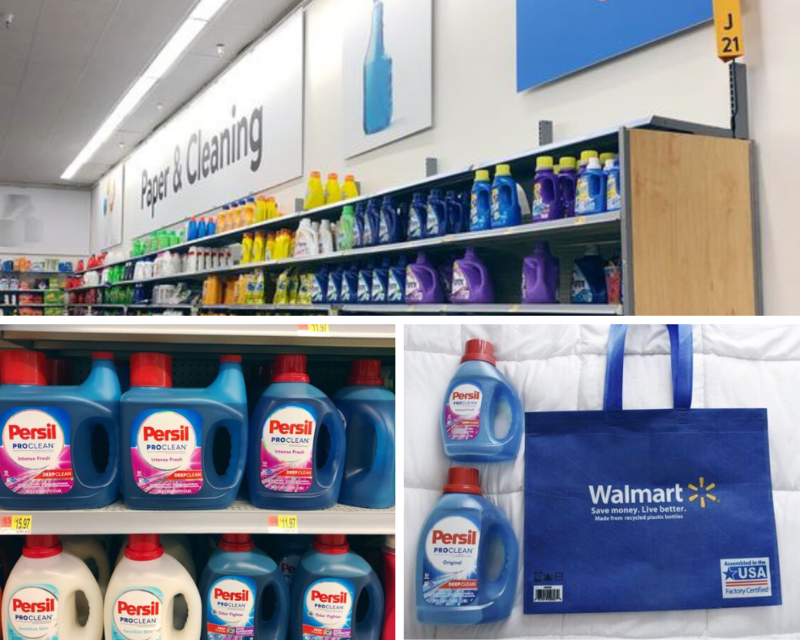 Make sure you go to one of these Walmart locations to Experience Deep Clean Day with Persil® ProClean® laundry detergent!​ To learn more about Persil® ProClean® click here. This step can look different for everyone! Some of you may have a dresser, or just a closet, or both. If you’re stumped on how to organize or store certain items, hit up Pinterest for best practices. For me personally, I organize according to “sections” first: dresses, tank tops, short sleeve, long sleeve, sweaters / cardigans, and “gym wear.” Which works well for me and my personal preferences. Feel free to really switch it up, after all- it’s time to spring clean! There are SO many different ways to organize your closet, such as: storage bins, floating shelves, specialty hangers, boxes, cubbies, shelving dividers, ect. If you’re feeling discouraged, reach out to your neatest friend, and enlist some help. Be sure to do whatever works best for you! Have you used Persil ® ProClean® before? Be sure to tell everyone about your experience with #DeepCleanChallenge #Sweepstakes on Twitter, Instagram, or Facebook. You’ll be entered for the chance to win some awesome prizes, including a laundry room makeover! "Exploring Sugar Shacks on Maine Maple Sunday"
"Hiking in The White Mountains: Diana’s Bath"